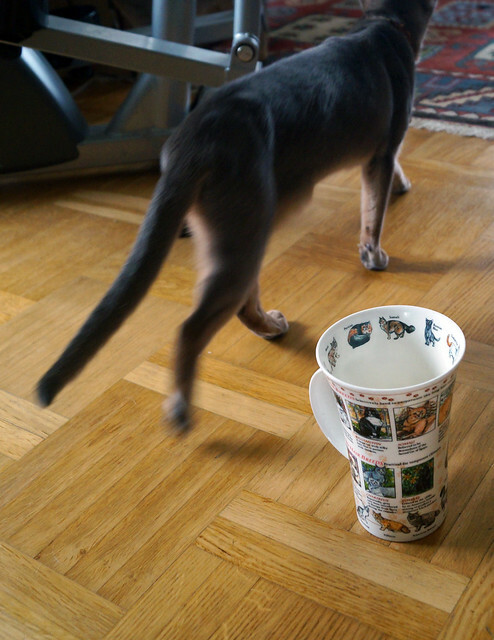 Björn had a wonderful Scottish bone china tea mug featuring men with dogs hunting quail made by Dunoon. Sadly, the mug was accidentally knocked off the counter and broken a month or so ago. 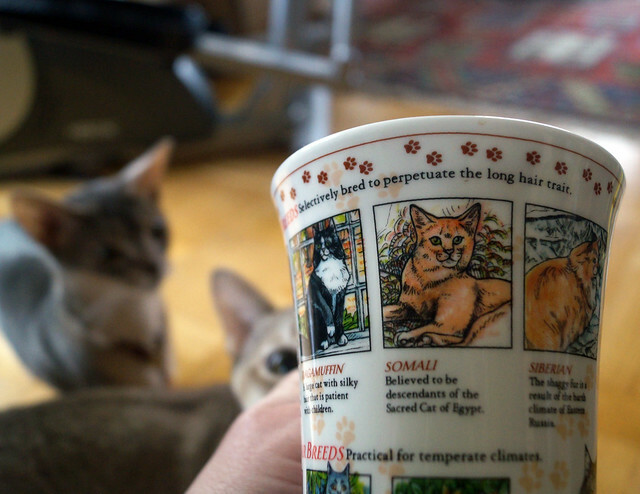 It really is the best mug for drinking tea, but that particular design has been discontinued. Whilst searching for a suitable replacement for his dearly departed mug, Björn also found the perfect mug for me! 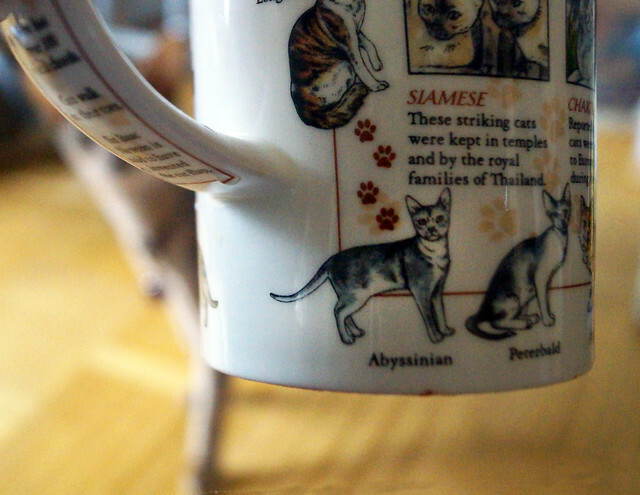 It features every breed of cat imaginable. Some are featured around the inside edge of the rim, and also in larger illustrations with descriptions on the sides of the mug. As you can see, the Somali is one of the featured breeds. As you can see it’s a fairly tall mug. It holds a half litre of beverage! 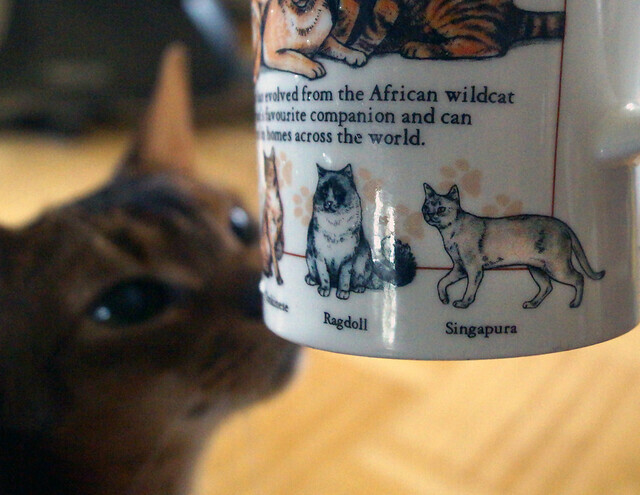 The Aby and the Singa are actually kind of next to each other, both next to the handle of the mug, which has a collection of “Cat Facts.” It’s an absolutely lovely mug, and I think it makes the tea taste better. Thank you, Björn, for introducing me to these awesome mugs! 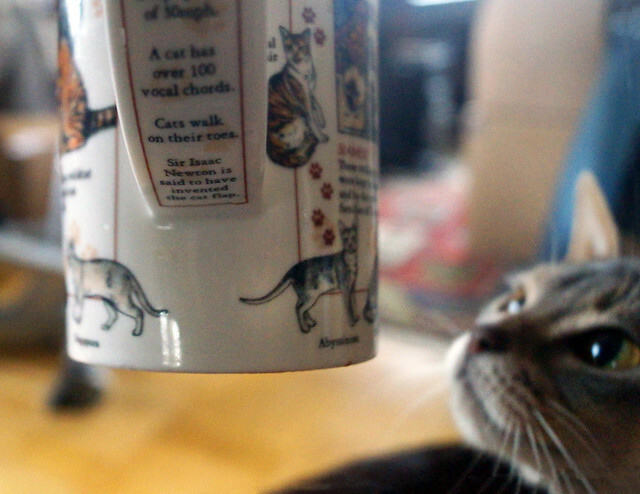 Hopefully, no cat was involved in the destruction of the Dog Mug. Wow, that is the coolest mug ever! And I’m not just saying that because Somalis are so prominently featured. They have a TON of really cool designs. Literally, something for everyone! How nice! I think the drawing of the Singa is particularly good. That IS a terrific mug!